The message of Guru Nanak is to accept all religions and that the Divine is one and the same for all. The Gurdwara is open for all to come and visit, and partake in the Guru's free kitchen and meditation/prayer. The Sikh scripture is not prescriptive, and to find information about marriage rites you have to look at the Rahit-name, i.e. codes of conduct. The primary scripture of the Sikh canon is the Guru Granth Sahib which is devotional, it does not describe in detail how a Sikh should conduct oneself in social life. Therefore, secondary scripture, the Rahit-name were composed in the times of Guru Gobind Singh to fulfil the needs for the emerging community, some three hundred years after Guru Nanak. We need to consider why these injunctions were not bound with the Guru Granth Sahib? I would argue that any code of conduct, like any law, is open to interpretation based on the circumstances. Therefore, these laws related to the Sikhs temporal life, were not fit to be bound with the spiritual content found in the Guru Granth Sahib. 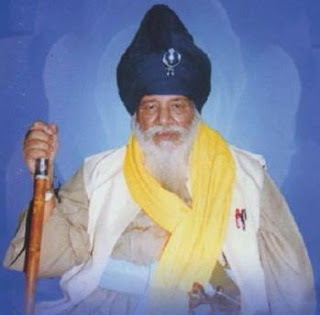 The Rahit-name are mostly referred to by Khalsa Sikhs, most Sehajdhari Sikhs will know very little about them, and generally will only accept what is written in Guru Granth Sahib. The practices of prima noctas by the Moghuls and foeticide by some sections of Indian Society, as well as no widow remarriage, and Sati, led to the chivalrous codes, one of which was to protect women. The community was small and thus had to ensure its survival. The Rahit-name clearly state a Sikh should marry a Sikh, and if someone wishes to marry a Sikh they should embrace Sikhism. A Sikh is defined as someone who believes and practices the teachings of all Ten Gurus, and the Guru Granth Sahib. Some would argue that as Sikhism is against empty ritualism, for a non-Sikh to be married before Guru Granth Sahib when she/he has no intent to follow it, is an empty ritual. The Prem Sumarag Granth circa 1700 clearly states a Sikh should marry his son or daughter within the Sikh community, after taking amrit. So, in actual fact the Sikh marriage rite of Anand Karaj was only prescribed for Khalsa Sikhs (which is still the practice at Takht Hazur Sahib, Nanded), while Sehajdhari Sikhs would have had some sort of marriage blessing in the Gurdwara. We must also bare in mind that to mingle with killers of daughters (female infanticide) and of wives is a serious kurehat, or major break from the Khalsa code, but those who marry their daughters to a non Sikh is a minor transgression or tankha. Point A is not adhered to as many Sikhs marry within their caste. Point B is that it is to interesting to note that it is about a daughter rather than a son. Point C is also interesting as this deviates away from traditional Rahitname. 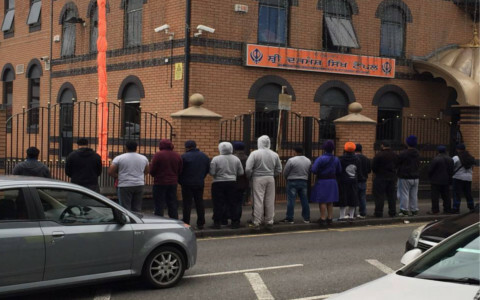 The issue behind the protests is that those individuals, who are predominantly male, see these marriages as the loss of a member of the Sikh community, to another. It would be interesting to find out if they have protested at the weddings of Sikh males, with non-Sikh females. This group has employed the Rahitname to support their protests, and seem to have coaching on tactics to employ against the police also. One of the Committee members discussed the issues with the group who said ‘ We are only following the maryada (injunctions) of Guru Gobind Singh, to which the committee member replied you know your Pita ji, but not your Baba, Guru Nanak then.’. An interesting debate was between the Hundal brothers, Jagraj Hundal and Sunny Hundal. Jagraj Singh is a Khalsa Sikh and runs ‘Basics Of Sikhi,’ and Sunny is a Sehajdhari Sikh and is a journalist. Sunny labelled this emerging group protesting at mixed marriages as the Khaliban, or the Sikh Taliban, which Jagraj Singh considers unfair, as they haven’t committed any act on level with the Taliban to date. However, Sunny’s argument is that if left unchecked, this type of ideology could one day lead to more dangerous forms of extremism. Perhaps, a good way of reaching common ground is perhaps to introduce a Sikh Marriage Blessing or prayer for any couple. Prem Sumarag Granth (Circa 1700), see JPS 15 for the dating of this manuscript. Shiv in Sarbloh Granth Sahib is about Parmesvar not the demi-God Shiva. Baba Ji now that term 'form of Shiv' what does it [mean]? ਉਦਯ ਸਿੰਘ: ਇਹੁ ਖਾਲਸਾ ਕਹਿੰਦਾ ਹੈ ਕਿ ਸ਼ਿਵ ਸਰੂਪ ਵੀ ਖਾਲਸੇ ਨੂੰ ਵੀ ਕਹਿੰਦੇ ਦਹਿੰਦੇ. 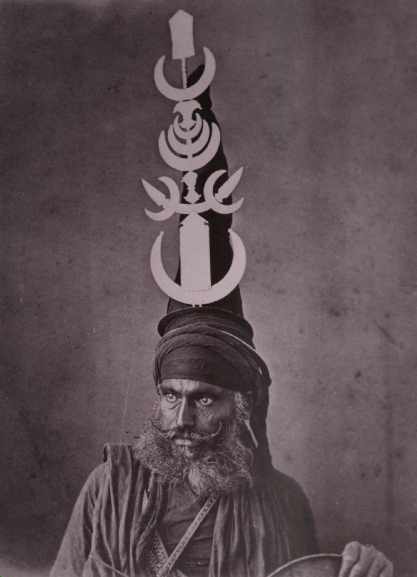 This Khalsa [Rajinder Singh] is saying that 'the form of Shiv' is also given to the Khalsa. The form of Shiv is the farla....the kesh. One minute, listen to what Baba ji says and let him speak, I am sitting here, please listen. This blue bana of the form of Shiv, they want a greater explantion of it, about this form of Shiv, does it have a relationship with Indian [mythology]? 0:46 - Baba Santa Singh: 'Nahi'. Why is the Khalsa called 'Shiv Sarup' they are asking about this? The Khalsa is the highest, the highest is the Khalsa. 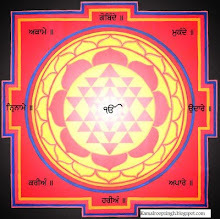 ਉਦਯ ਸਿੰਘ : ਸ਼ਿਵ ਮਤਲਬ ਅਕਾਲ ਪੁਰਖ ਦਾ ਨਾਮ ਹੈ ? Is the name Shiv the name of Akal Purakh (God)? ਬਾਬਾ ਸੰਤਾ ਸਿੰਘ : ਹਾਂ "ਯੇਸ"
The Akalis we believe that the Akalis are of Akal Purakh and [his] army. ਬਾਬਾ ਸੰਤਾ ਸਿੰਘ ; ਹਾਂਜੀ ਸ਼ਿਵ ਸਰੂਪ ਖਾਲਸਾ ਪ੍ਰਧਾਨ ਹੈ "
Yes, the form of Siv the Khalsa is the chief. They are asking the meaning of the word Shiv. ਬਾਬਾ ਸੰਤਾ ਸਿੰਘ : ਸ਼ਿਵ ਪ੍ਰਮੇਸ਼ਵਰ"
That Shiv is God and not joined to the god Shiva. ਉਦਯ ਸਿੰਘ : ਸ਼ਿਵ ਸਰੂਪ ਜਾਣਾ ਮਤਲਬ ਸ਼ਿਵ, ਸ਼ਿਵ ਜੀ ਦਾ ਸਾਮ੍ਬੰਦਿਤ ਨਹੀ ਅਕਾਲ ਪੁਰਖ ਦਾ ਹੈ ਅਕਾਲੀ ਵੀ ਹੈ ਅਕਾਲ ਪੁਰਖ ਦਾ ਸਰੂਪ ਵੀ ਕੇਂਦਾ ਤਾ ਸ਼ਿਵ ਸਰੂਪ ਵੀ ਕੇਂਦਾ ਸ਼ਿਵ ਅਕਾਲ ਦਾ ਨਾਮ ਹੈ ਅਕਾਲ ਦਾ ਸਮ੍ਬੋਧਕ ਹੈ. The meaning of the word Shiv Sarup, has no relationship to Shiv ji, it is a name of God, the form of an Akali is the form of Akal Purakh, which is called the Shiv Sarup, Shiv is the name of Akal, and addressed to [Akal Purakh]. We can only conclude that the individuals propagating this ideology are making fools out of people who do not understand Punjabi, and those that have a limited understanding of their own Mother tongue! They are also ruining the memory of one of the greatest scholars the Panth has known Akali Nihang 96 krori Jathedar Baba Santa Singh ji. Mahadev kau kehat sada Shiv. Nirankar ka chenat nahi bhiv. He calls Shiva "The Eternal Lord, "but he does not know the secret of the Formless Lord.392.